The last few weeks have been horrendous, and to write about it just now would be emotionally devastating. Dobby is writing about his own gruesome story, so that eases my burden. I will soon be distracted by my own root canal, a little surprise with a price tag to rival the veterinary bills that are stacking up like pancakes so cold and ugly no one will eat them. Unfortunately I can’t just toss the bills to the chickens. So I am left to contemplate the consequences of my decisions, and the random death and destruction at my funny little farm. Why do some survive without effort while for others life is a continual struggle? Life isn’t fair, but death has got to be a lot worse. What about the survivors? How about Fabio the duck? Why did he live so long? Why him? Is long life just a random assignment, like good hair, or getting in the fastest checkout line? 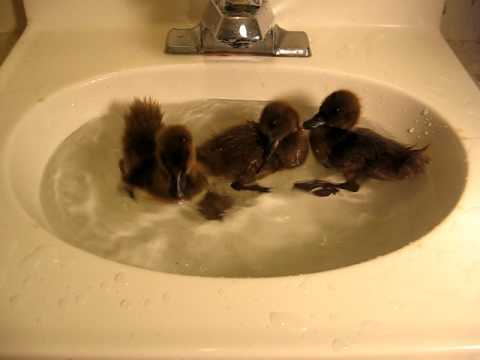 Fabio came in with six other ducks, a term I use loosely, because Miss Goosey was, well, odd. She was probably half Muscovy duck, and certainly had the big feet and obnoxious personality. The others were “Runner Ducks” but in fact they were mutts. Some Rouen, some Khaki Campbell, a bit of Swedish, and then Fabio, with his telltale Powder Puff parentage. Fabio, left, young and handsome. Barry on the right. Destined for the soup pot because they were no longer effective for herd dog training, a friend delivered them to me. From the moment they arrived, the seven moved around the pen as a unit. Obviously they would be no challenge for herding dogs. 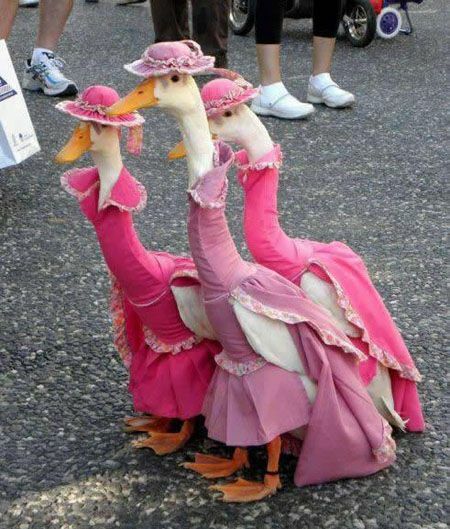 I also discovered they were all drakes, save for Miss Goosey. That didn’t prevent me from naming two Paris and Nicole (they were inseparable). Barry had an odd marking around his head, so he was named after my son’s teacher who had recently undergone brain surgery. Jose II closely resembled my first drake back in 1984, and Beetle Bailey wore his khaki camo uniform with pride. Fabio witnessed many changes to the Funny Farm. Twenty doves arrived and a domed cage was built. A couple dozen hens and Muscovy ducks came and went. He saw guinea fowl and quail, rabbits invaded and then a couple tomcats moved in. Paris and Nicole were the first to leave the flock, and then Beetle Bailey. Goosey tried to die once, getting her neck caught in chickenwire I had used to keep her out of my whiskey barrel full of goldfish. She loved to play “pretend nesting” in the rabbit litter box, and then she passed, too, during The Raccoon Massacre of 2010. Barry, Jose, and Fabio flew below the radar and survived winters, summers and The Raccoon Massacre of 2012. Major repairs were made to the aviary, and more Muscovy ducks and hens arrived. Eventually, Jose and Barry passed, leaving Old Fabio with the geese, murderous Shamrock, and the rest. Fabio had witnessed the arrival of Dobby and the geese, all six swimming pools, and I recognized how old he had become. He moved more slowly, became even more timid, and spent his Garden Party afternoons quietly observing the others. I thought every winter would be his last, but Old Fabio survived over and over, and managed to limp through another summer. In a rare victory, Fabio won. By now, my flock was all drakes. Females were easier to rehome, but nobody wants drakes, and without the girls, the males fought less. Even so, Old Fabio was fragile, so I set up the bully pen. At first I separated Old Fabio out to keep him safe, but quickly realized he was missing the garden parties during his incarceration. I turned the tables and locked up the bullies, allowing Old Fabio the luxury of his usual space and activities. And he lived on and on and on. Norman the goose, my flock manager was always protective of him. Old Fabio was his elder by many years, and as cruel as fowl can be, they do seem to respect the old ones. When Fabio passed, it was no surprise. During his last several years I had been checking for him first thing each morning, always surprised by his continued survival. I feared he would outlive his little legs that had been lamely supporting his limited senior activities. He had moved himself to the barn for sleeping, out of the rain and cold, but distant from his ducky companions. He knew how to survive, that one. Fabio, on high alert because I usually bring out lettuce. Vinny and Sal in the background. It was near the end of his stay here when I bought Mazuri waterfowl food, again. It comes in GIGANTIC bags, 50 inefficient pounds of expensive food, especially if they refuse to eat it. And refuse to eat it they had, at least three times previous. “We hate it!” But it is supposed to be the best, right? Old Fabio was so feeble, I decided to try, one more time, to try to get them to eat it. The flock turned up their noses nares and walked away. Fabio, shy old codger, walked up and took a bite. And loved it! For a few weeks, he was the only one who ate it. Eventually, the others caught on, though they always deferred to him and ate second. And so he taught them to eat proper duck food. And I’m glad it comes in such big bags, because now they are pretty hysterical about it, lining up and waiting turns until it is gone. Last summer he was looking a bit rough, moving slowly and with caution. He spent more time in solitude. I kept an eye on him, but he managed pretty well, and marched out the the garden with the others most days. Reminiscing about Fabio I realized how I had always taken him for granted. Months later I miss looking for him, checking on my shy old drake, morning and night. He was my old pal. Fabio was stand-offish, painfully shy. He wasn’t aggressive, not submissive, either. He was an unremarkable drake. I looked through nine years of photos and while he was in some of the group photos, he was usually in the background, or even behind another duck. I began to realize this was how he had managed to survive. He blended in with the flock, never drawing attention to himself, quiet and discrete. For nine years. Yet he led them to proper nutrition. I try not to play favorites with my animals, and yet I do have preferences. I tend to like the bad animals. Not necessarily the bullies, but the naughty ones. The insubordinate, the asshats who are a constant challenge. They nip and chew and destroy. I am not much of a disciplinarian, so they wreak havoc and I live with their supposed dominance. Yet these frisky ones never seem to live as long as the Fabios. Their risk taking, their aggression, seems to put them on the front line. Shall we all take a moment to appreciate the quiet ones, the unremarkable pets who bide their time? Without them it would be nothing but mayhem, so thank you, little shy ones. Garden Party, Fabio in the center. Note the wild mallards, foreground. Now available! Meet Luna the rabbit! She appears to be at least part lionhead, but she is guaranteed to be 100% rabbit! If you can give a beautiful bunny a good home, please contact me. This is what I know: the shelters are full and are no longer taking rabbits in our area, Seattle and the Pacific Northwest. This is a real pickle for someone trying to rehome a rabbit. I don’t have space, either, so she is still at her home, but she needs a new one. Luna is about a year old, not spayed, and not particularly friendly. She has not had much attention for most of her life, but is indoors, uses her litter box, and has had half a bedroom for romping. She is healthy and gets along great with her family cat. Luna comes with her cage, various rabbit accoutrements and paraphernalia, and she is available NOW! The silence is profound and eerie. Spike the Budgie sings no more. Typical of a prey animal, he hid his illness to the end, and sang his heart out to cover his fear. The cockatiels, Vincent and Jorge, shrieked with his song, trying to alert me to his plight, but I did not see the signs soon enough. Now he is gone, and so is his ridiculous, ubiquitous chatter. Spike is above the WOK, and Krumpit the sparrow’s head is just visible at the bottom corner of the green cage. Spike started singing, the sparrow started eating and we were good for a few more years. Spike turned out to be a small but devilishly quick bird. For a while I kept his wings clipped, but he usually behaved himself and I eventually let him fly. I set up a bird playpen in the living room so he could watch tv with us, or maybe just admire himself in his tiny mirror. When he got bored, he would make a beeline for the open door of his cage, flitting through the dining room, taking a hard right at the kitchen, negotiating potted orchids and miscellaneous appliances on his way home. Unlike other birds I have had, he never dropped out of sight behind bookcases, hid from us high up on beams or hunkered into the folds of curtains. He did some hiking, which is dangerous when you are 3″ tall and the carpet is Persian camo. Most of his trekking was limited to the under-coffee-table area, with its chrome legs and unlimited supply of crumbs. Spike loved to torment The Pirate. Mostly, though, we miss his singing. He is featured as background in many of Dobby’s videos. We marveled at Spike’s ability to sound like dozens of birds carrying on conversations with each other at the same time. He was chatty and cheerful to the end, when I wish he had instead communicated his illness. But that is not the way with prey animals, and he hid it well. Too well.